Previously teased right here just a few days back, we can now reveal that the “Winter Nibbler” sofubi from The Tarantulas will be seeing a special “Prototype” release as part of Superfestival 69 this weekend! Originally seeing a number of releases in resin over the years, the fully Glyos-compatible figure has made the transition into soft vinyl courtesy of Rampage Toys, coming complete with a new capped bottom design as well as the original’s interchangeable arm joints. 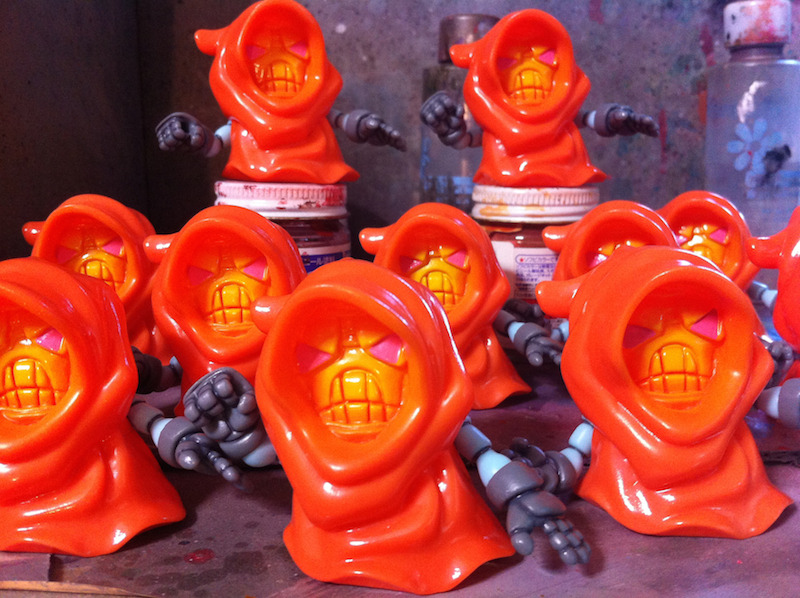 Produced in what appears to be an orange vinyl with yellow and pink sprays plus complementary grey PVC Glyos arms, these “Prototype” versions will be available in strictly limited quantities from the Rampage Superfestival booth this Sunday, September 27th for an undisclosed sum… Look out for the first official release soon! This entry was posted on September 22, 2015 by trutek. It was filed under glyos, mini figures, sofubi, vinyl and was tagged with glyos, mini figures, onell design, prototype, rampage toys, sofubi, sofubi mini, superfestival 69, the tarantulas, winter nibbler.